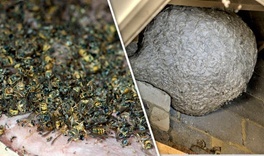 Removing a wasps nest from a Brentwood Dance School with 40 children due to turn up for lessons. After a spring garden tidy-up, our client noticed rat burrows near a sewage drain. We visited the same day and the rat infestation was removed! A family returned from holiday and brought with them some unwanted bedbugs. After a same-day visit, we treated the bedroom and the home was bed-bug-free.